Now…. A blog is utilized by a big-time CEO in a skyscraper! How times have changed…. It almost makes me nostalgic. They’re remarkably easy to set up. And they’re free. Yay, WordPress, yay, Blogger. Just about anyone can set up a professional blog with ease; and the plugins, features and benefits are immeasurable. If you’re a small business, call center, or corporation utilizing auto attendants as part of your operations, you’ll know straight away that having a blog is numero uno on profitability. It’s because of that blog that you start making money. You get most of your clients that way, and you retain them for a long period of time. So What’s This “Ning” Thing? 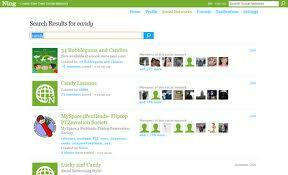 Ning is essentially a “blog management” service to the extreme. Not only does it provide you the tools to create your own professional blog, it offers you the features and service to organize events, set up chats right on the site, utilize forums, set up groups, set up an “activity stream” (yes, like Facebook and Google+) and even link all of that with built-in integration to just about any social site you can think of. Facebook, Twitter, YouTube, you name it. Seriously, that makes you wipe your brow with sweat! It does it all for you. It’s not just a blog. It’s a terminator typing the blog for you. Even Arnold Schwarzenegger would bow down. That’s not all…. Ning can set up your blog site to even act as a revenue builder, allowing you to charge members for simply accessing the site. You can run your own ads and even sell brands on the site with ease. Checking data and analytics are available, too, and rightly so: if WordPress can do that, so can you with Ning, and so much more. And there’s more? Oh, yes. SEO tools? You betcha. Easy use? Exactly. Ning provides you those tools without any hassle, and before you know it, your online business is soaring faster than Facebook can notify you of your next cow on FarmVille. 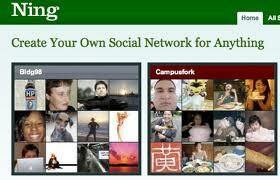 And, yes, Ning is even available on Android and iPhone/iPad. Sheesh, and yet why did I give this only 3 stars?? I’ve got to tell you — this was a tough rating to give. Usually, it only takes me about ten seconds to decide what service or app should have in terms of stars, but this took me more like a minute. Again, though, keep in mind just what blogs have been offering to our digital society: free content. Ning doesn’t come cheap. You’re looking at $24.95 per month, at the very least. The typical package for that price would include up to 10,000 members, up to 10 GB of storage, and even e-mail support. Okay, so that’s nice. You get publishing and social benefits as well as a built-in mobile site for your mobile needs. A turnkey revenue option is available as well as custom design and URL. So it’s built for business, basically. Again, though, it’s a monthly charge. If those features aren’t enough, you can go PRO with Ning and purchase a plan for $59.95 a month. Unlimited members, 20 GB of storage, phone support, branded music and video players, API access, custom splash pages, and even a mobile app creation feature are available when you shell out that kind of dough. And that’s not all…. You can go further and even purchase a VIP plan at a specified quote (think major dollar signs here). What does this plan offer? 1 terabyte of storage (which is a ton), recovery back-ups, 24/7 IT support, guaranteed uptime, and all the other PRO features, and even an actual “account manager” to handle all your business. Holy FarmVille cow! It’s like shopping at Ralph Lauren versus Walmart. Here’s the thing, though…. You’re a small business. You’re an entrepreneur. Do you really need all of that? Blogging is easy. Syncing with social sites? Easy. It’s been set up to be easy. If you can’t do that on your own, you’re not a monkey; you’re protoplasm. Ask any CEO out there; they know how to do it. So why spend a ton of money for all these extra features when you may not even need it? No matter how you slice it, though, Ning’s making a killing. And they may well be considered the king of blogs. The way the corporate arena works is if you are doing so well in your business and want to continue optimizing your operations, Ning may definitely be a way to go. Just be prepared to spend the money. It’s professional online service for your blog needs and social media needs tied to your blog. So the benefit is there. Generally, though, if you’re a small business, you’re probably a lot more localized and plan to stay that way…. So stick with WordPress or Blogger. Save some money. This entry was posted in Android Apps, Halloo, iOS Apps, iPad Apps, Marketing, Phone Apps, Sales, Small Business, Virtual Office and tagged advertising, blog, Blogger, content, entrepeneur, marketing, Ning, small business, Wordpress by Pierre. Bookmark the permalink. I heard that they have recently updated their platform. They have a new design and add functionality. As I know, there will be an opportunity to add and listen to music. And, maybe, there will be even e-commerce. I think it`s a good sign that the company is moving ahead. I don`t know for sure, but looking forward to. 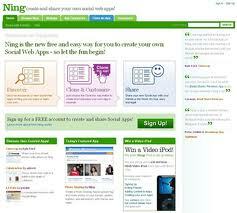 I think that Ning is an excellent tool for creating your own blog. My blog is 4 years old already. The good thing is that I can manage my blog myself, add any content I want and apply various custom functions I need. With Ning, I can freely design my blog, promote my content, and develop SEO and layout. A good bonus is the ability to independently monitor all my files.